The Port Cunnington Ratepayers Association is a collective community voice to address issues and opportunities for making our community a better and more interesting place to live and play. Our mission is to represent members’ interests and to foster, encourage and support the safe enjoyment and sustainable development of the Port Cunnington community and its adjacent areas. 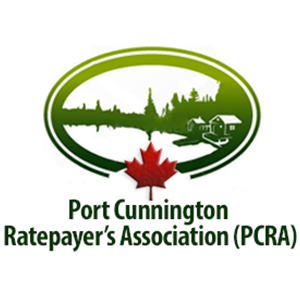 The Port Cunnington Ratepayers Association (PCRA) is an organization formed to represent the interests of its members including matters related to environmental protection, water quality and safety, real estate and business development, municipal planning, municipal administration impacting Port Cunnington and Lake of Bays and the property and businesses of the members. Membership in the Port Cunnington Ratepayers Association is open to any registered land owner who accesses their property (directly or indirectly via secondary roadways) from Port Cunnington Road or that portion of Fox Point Road which runs between Hwy 35 and its junction with Fox Point Road. This membership includes those island and/or water access property owners whose access point to their properties is reached by either of these roadways. Click here to download the 2017 PCRA By-Laws. working with professional consultants to ensure that Council protects the public interests that were cited as of importance through the proceedings before the OMB regarding the development of Bigwin Island. planning applications of interest currently include expansion of Port Cunnington Marina, Haystack Bay Marina and Bigwin Island North Landing (Drydock). working with Township and District staff to address road traffic and safety concerns for those who walk, run, bike or drive along Port Cunnington Road. exploring opportunities to provide community first response fire equipment and defibrillators in centralized areas for community access.